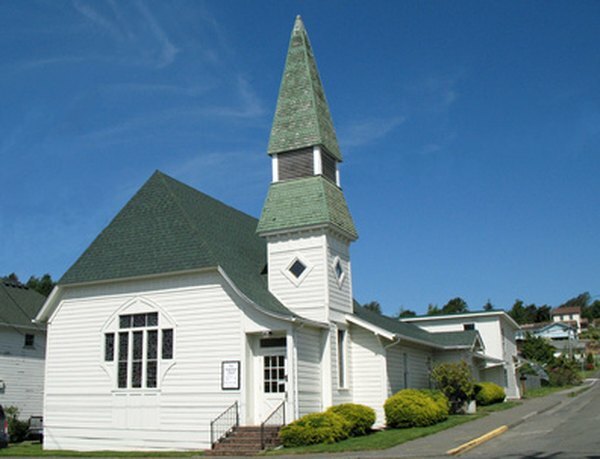 Donations to churches are generally tax-deductible. The Internal Revenue Service allows you to deduct the amount of certain donations to nonprofit organizations from your taxable income on your federal income tax return. You must carefully follow IRS rules when preparing your tax return. Only donations to certain organizations are eligible for tax deductions, and the IRS imposes limits on how much you are allowed to deduct. Although you must document your donations, documentation requirements are not extensive. To deduct donations on your tax return, you must donate to an organization qualified under Section 501(c)(3) of the Internal Revenue Code. Normally, the organization must file Form 1023 with the IRS and receive a determination letter to qualify. Eligible organizations include most nonprofit churches, hospitals, universities, public charities, literary organizations and scientific institutions. Churches, though, can be treated as 501(c)(3) organizations even if they never filed Form 1023 with the IRS. The IRS does impose qualifications on churches, though, such as a recognized creed and form of worship. Because the IRS can retroactively revoke 501(c)(3) status from a church, thereby revoking your deduction, many churches file Form 1023 anyway. You can deduct the face value of any donation you pay for by cash, check, electronic funds transfer, debit card, credit card or payroll deduction, as long as your donation is to a 501(c)(3) organization. Although you can't deduct the value of your time or services, you can deduct your out-of-pocket expenses -- such as mileage expenses -- that you incurred in spending time or performing services. Your deduction is limited to a certain percentage of the adjusted gross income that you figured on the tax return that you prepared for the year you claim the deduction. For donations to most qualified organizations, the deduction limit is 50 percent. You can't deduct more than 30 percent of your adjusted gross income for donations to "private foundations," defined by the IRS as 501(c)(3) organizations that receive most of their income from investments and endowments and use most of their income to make grants to other organizations. You can carry over any excess donations to the following year's tax return, for up to five years from the year the donation was made. To deduct charitable donations, you must itemize your deductions -- you can't take a donation deduction and use the standard deduction at the same time. Consequently, you shouldn't claim a deduction for donations if your standard deduction exceeds the amount of your deductible donations. You must complete Schedule A to itemize your deductions, and you must also report your deductions on Form 1040. File Form 1040 and Schedule A together. To prepare for a possible IRS audit, you should carefully document your donations. A 501(c)(3) organization is required to provide you with a written acknowledgement if you donate more than $250 in a single year. Keep these acknowledgements, and make your own records of your donations, regardless of whether they exceed $250. You don't need to submit this documentation with your tax return.